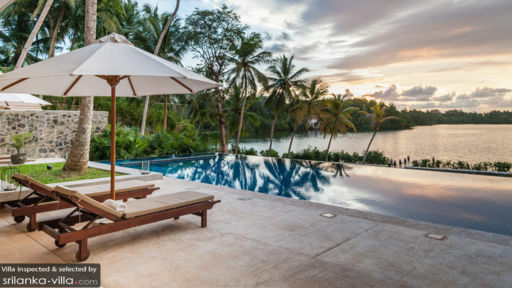 The serendipitous discovery of Villa Serendipity on the shores of the Koggala lake in southern Sri Lanka offers its guests a different kind of experience from the usual villas dotting the southern coastline. The Koggala lake is renown for an abundance of birds and is covered with small uninhabited mangrove islands to be explored. This backdrop makes Villa Serendipity the ideal getaway for those who crave some peace, quiet and serenity in a luxurious villa, with the exception of the pleasant twitter of birds. Villa Serendipity has five elegant and spacious bedrooms in the main building with canopy beds, private sitting areas, writing tables and bathtubs. A more private suite in available in the garden overlooking the lake with its own billiard table. With a veranda overlooking the 20 meter infinity pool and the garden extending over onto the Koggala lake, Villa Serendipity is ideally placed for its guests to feel at one with nature whilst experiencing the best of modern luxuries. The large two story building has been especially designed for its guests to appreciate the stunning surroundings to the fullest. With large bay windows facing the Koggala lake, high ceilings, open spaces tastefully decorated with carefully chosen antique furnishings, the common living room at Villa Serendipity has many cosy corners to read a good book or lounge on a comfy sofa. The villa is fully staff fully staffed with friendly team who will do their utmost to ensure their guests perfect and unforgettable stay at Villa Serendipity. 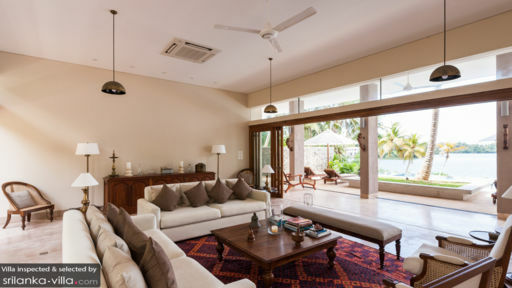 Villa Serendipity is ideally located with easy access to many sightseeing opportunities including the UNESCO world heritage site of Galle Fort; sea-turtle hatcheries in Kosgoda and Koggala; boat rides to discover local birdlife as well as the islands on the neighbouring Koggala lake and snorkeling in the Unawatuna bay. All these sites are just a few kilometers away. We were there for two weeks with my wife and baby. It was one of the most exquisit vacation we ever had. The house and domain is unique in its privacy, luxury and style. It's modern and airy with all comfort and good taste. The staff were extremely friendly and were great with our baby. My wife and I love India and Indian food, but SL and the food in this house beat even our highest expectations. Try the various types of curries that the team can prepare to your liking. They will make whatever you like for you. In our case that was curries and coconut cocktails most days. Excursions from there are easy and Gale is very close to go visiting or shopping. We will go again as soon as we can with a group of friends to enjoy the big domain to the fullest. You really have to see it to believe it. Hidden down the winding backstreets hides this little gem. Nestled on the banks of the lake is this amazing villa. Private, secluded and breathtaking views across the lake. Rooms are big and airy with outdoor showers. Large living space, beautiful gardens and infinity pool. But the real star are the house boys and chef. Food was out of this world and nothing was ever any trouble for them. So polite, attentive and patient. Will definite visit again and can highly recommend this villa. You will not be disappointed. From the moment we arrived to the moment we left, Serendipity Villa and its staff was probably the best Villa holiday I have ever had. The sunset location of the Villa in Koggala Lake makes it perfect for one of the most beautiful sceneries you can experience. The rooms and comunal areas of the Villa were just fantastic, very spacious yet cozy and everything is decorated to the utmost taste and detail. The staff were the most attentive 3 boys you could expect, always smiling and willing to be of assistance, and always around at any time of day or night.